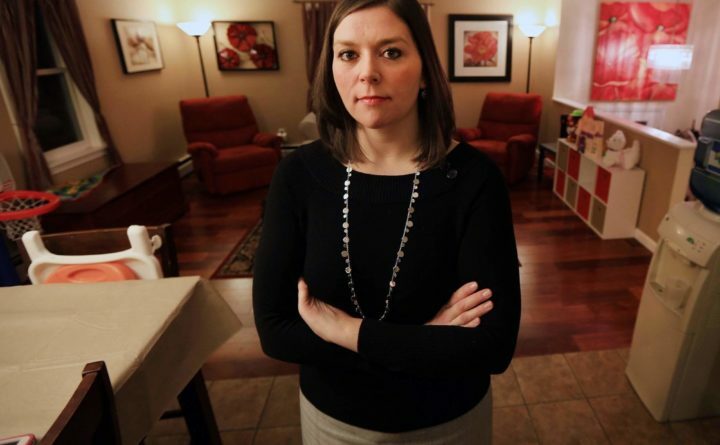 Andrea Amico of Portsmouth, New Hampshire, is co-founder of the community group Testing for Pease. Two of her young children and her husband were exposed to the contaminated water at the former Pease Air Force Base. PORTSMOUTH, New Hampshire — A key funding bill agreed to by U.S. Senate and House negotiators includes $10 million to pay for the second year of a national health study on the health effects of PFAS exposure, U.S. Sen. Jeanne Shaheen announced Friday. Shaheen established the first-in-the-nation study on PFAS exposure in the fiscal year 2018 National Defense Authorization Act. Friday’s news about the negotiated funding bill means she has now secured a total of $20 million for the national health study, which will be conducted by the Agency For Toxic Substances and Disease Registry. PFAS stands for per- and polyfluoroalkyl substances, according to the U.S. Environmental Protection Agency, which describes PFAS as “a group of man-made chemicals” that can be found in polishes and paints. “Granite Staters deserve answers, and this study is critical to delivering that information to our families here in New Hampshire, as well as other states that have been similarly impacted throughout the nation,” Shaheen said Friday. Thousands of people who work Pease International Tradeport, and children who attended two day cares here, were exposed to PFAS chemicals in the now closed Haven well, which is owned by the city of Portsmouth, at the former Air Force base, a Superfund cleanup site. In addition to being a suspected carcinogen, ATSDR states PFAS exposure can harm childhood development, increase cholesterol levels, hurt the immune system and interfere with the human body’s hormones. Shaheen, D-N.H., is a senior member of the Senate Appropriations Committee. She said the negotiated legislation for fiscal year 2019 funds the Departments of Defense and Labor, Health and Human Services, Education and other agencies. The bill is expected to pass both chambers of Congress and be sent to the president’s desk. Andrea Amico of Portsmouth, co-founder of the community group Testing for Pease, called Shaheen’s announcement “really positive news.” Two of her young children and her husband were exposed to the contaminated water at Pease. “It’s important that we do anything we can to continue to secure resources to make sure this multi-state study can be funded and get the most information about what health impacts these chemicals can cause,” said Amico, who credited Shaheen with her success in fighting to get the money for the health study. Amico received a call last Friday from Hassan’s office, asking her to testify at the hearing. “I was incredibly honored to be invited to go to Washington, D.C. and testify,” Amico said. “I hope to bring the community perspective of New Hampshire residents there, but also the perspective of advocates from across the country who I’ve gotten to know through my work on a national PFAS coalition,” Amico said.